Piri Reis was a noted sixteenth century Ottoman admiral, geographer, and cartographer. 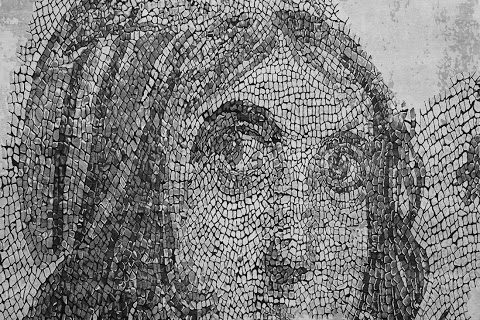 Born Ahmed Muhiddin Piri (1465/70–1553 CE) he was a government backed privateer who sailed with his uncle before his eventual promotion to Admiral (Reis) in the Ottoman Naval Fleet. 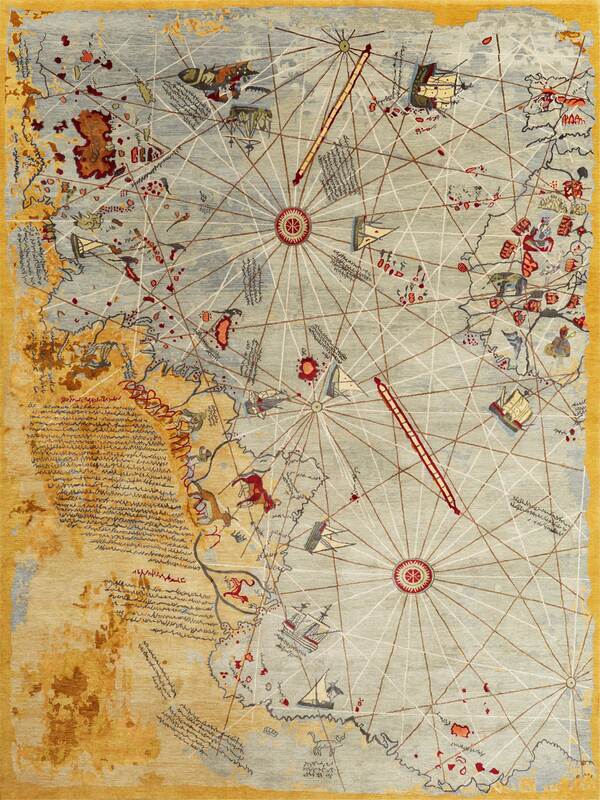 Known for his Kitab-ı Bahriye (Book of the Sea) which describes (in accurate detail for the time) important ports, cities, and navigational charts of the Mediterranean, it is his composite first world map of 1513 that brings his mention today. ‘Piri Reis’ by Wool and Silk, 150 knot Nepali-Tibetan carpet, wool and silk carded blend on cotton, Nepal, 2015. | Image courtesy of Wool and Silk. Just as the map of Hacı Ahmed Muhiddin Piri (Hacı being the Turkish equivalent of the honorary and informal Islamic title Hadji) reflects state-of-the-art cartography of its time, the carpets of Wool and Silk, and particularly this piece embody start-of-the-art carpet weaving of this time. 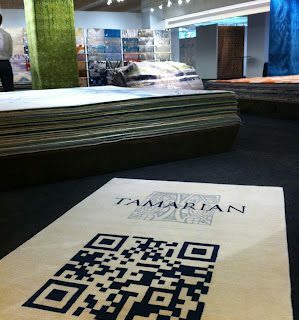 The production of this carpet is made far easier by the ‘mapping’ technology of computer aided design, and specifically the use of Galaincha software to render the graphs – or should I say maps – for weaving. It’s a playful fusion of centuries spanning technologies and craft that bring the best of each genre together. Surviving fragment of the Piri Reis map showing the Central and South American coast. The appended notes attribute part of the work as ‘the map of the western lands drawn by [Christopher] Columbus.’ | Image from ‘To The End of the Earth’, Jeremy Harwood, Struik Publishers, 2007, ISBN 978-1-77007-608-2, p.69. The map was drawn on gazelle skin parchment which like all parchments has great stability and permanence if kept in a dry, stable environment. 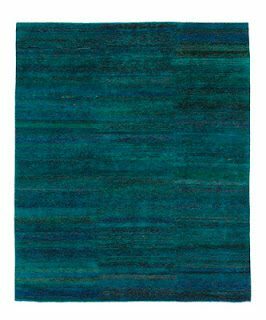 The carpet from Wool and Silk is made using Nepali-Tibetan construction with Tibetan highland wool and cultivated Chinese silk on a cotton foundation. Not dissimilarly to the map, these materials will endure generations if cared for properly. Piri Reis is a spirited carpet that serves as homage to the rich cultural heritage of its Turkish designer Erbil Tezcan. Fun and lively, a definite conversation piece, the carpet reminds of the blending of cultures and technologies that make contemporary civilization what it is, much the same as Reis blended the work of others in creating his enduring mark on the cartographical history of the world. Who knows? Perhaps a future historian will discover this carpet and marvel at the mark this era of carpet making left on the craft.